If I ever missed a calling, it was probably as a musician. But then again, I may not have the discipline and singleness of purpose that it would take to be really good, and if I can’t do something well I don’t do it ( I find this an excellent excuse for the housework situation). I sang in a children’s choir for several years, and loved it – except for the time a kid in the row behind me let his nerves get the better of him and threw up on everyone in front. I played piano against my will for a while – the piano had to compete with the horses for my time, so it didn’t have much of a chance. When I was twelve my mother tried to interest me in the violin. I remember the conversation vividly, with regret. While in university, I considered working a trade with a musician: violin lessons for riding lessons. Nice idea. So, my musical background has been as a listener rather than as a performer. I have always had freakishly diverse tastes in music, and I’ll bet I was the only sixteen year old in Canada who had Softcell, Chopin, Soviet Red Army Chorus, Neil Diamond and Andean flute records in active, simultaneous use. 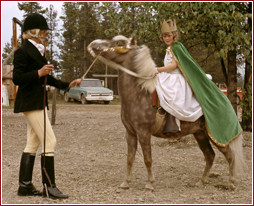 I have been riding ever since I was three, when my mother defied my father – who, before setting out on a climbing expedition said, "don’t you go to that auction, and don’t you buy her a pony". My initial training was in dressage, though I turned to the adrenaline rush of three-day-eventing as a teenager. I trained with and worked for Canadian Olympian and Pan American Games individual gold medallist Nick Holmes-Smith. 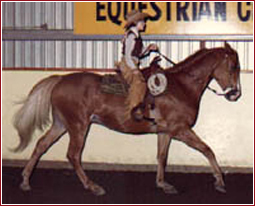 In 1985, with my quarter horse Sunset Snap, I was a member of the gold medal-winning BC team at the American Continental Young Riders’ Championships in Wadsworth, Illinois, finishing eleventh individually. 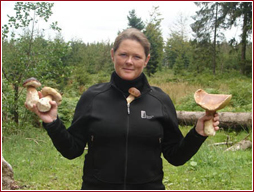 I have been a coach, trainer and barn manager for periods of my life, and I have competed in just about every type of equestrian event there is, from Arabian costume to trail class to ski jorring (a race that involves dragging a skier over a snow track). When I turned thirty, the part of my brain that administers self-preservation woke up, and I retired from eventing to the more subtle thrills of dressage. 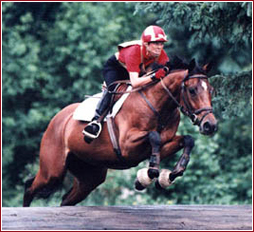 In 2000 I finally dipped my toe in the FEI dressage arena, competing at Prix St. Georges with my thoroughbred, Punch. Intrigued by the freestyle since it first appeared in international competition, I started competing in freestyle classes at dressage shows in the mid-nineties, with immediate success. Helping a few friends with their freestyles turned into seasonal work, as more riders approached me. In November 2000 I finally quit my job as an operations manager in the publishing industry to pursue freestyle design as a full-time career. Well, not quite full time. I recently started writing articles for equestrian magazines, and I find this work an excellent compliment to the freestyles. I am also jumping through the first hoops of becoming a recognized dressage judge. Oh, the list! Well, traveling has to be number one. If I didn’t own a horse, I would probably live out of either a backpack or my VW van. I have spent about a quarter of the past fifteen years in other parts of the world, and I hope to continue chalking up the miles for the rest of my life. I speak several languages fluently, a couple haltingly, and I can order a beer in just about any language I’m ever likely to need. When I’m not designing freestyles, writing articles or riding, I can be found reading, cooking, sailing (my husband’s boat keeps him quiet about how much it costs to have a horse), skiing, or if I’m lucky, some combination of these. A picture of heaven for me would include a glass of wine, a bowl of olives, a new Michael Ondaatje or Louis de Bernières novel, a view of just about anywhere in southern Europe, some ethnically appropriate music playing, and Jan, my husband, setting up the backgammon or boules somewhere nearby.